White House Situation Room, Sunday, May 1. The "minutes passed like days"
Sometimes the tabloid route is best: Obama got Osama. President Barack Hussein Obama approved the attack that killed his near namesake Osama bin Laden the very same week that Obama revealed his long-form birth certificate, addressing a silly dispute that was really about something heinous and serious: the suspicion of far too many Americans that the President was not who he said he was, that he was a secret Muslim and maybe not even playing for our team. All such doubts are resolved now, by document and deed, although the various birthers and truthers and mouthers will continue to play their vile games. But the facts are there for posterity and for the voters who will have to make a judgment in 2012: this profoundly American President ran an exquisite operation to find and kill one of the great villains of history. In the process, U.S. presidential politics and the so-called war on terror were transformed dramatically; suddenly, both foreign policy experts and Republican candidates for President had vast new landscapes to consider. And so much for No Drama, by the way. there is no measure of competence the public takes more seriously than a President's performance as Commander in Chief. On the most basic level, the bin Laden raid was a vivid demonstration of how this Commander in Chief operates. He is discreet, precise, patient and willing to be lethal. He did not take the easy route, which would have been a stealth-bomber strike on bin Laden's compound. He ordered the Navy SEAL operation, even though there were myriad ways it could have failed  or turned out to be an embarrassment if bin Laden hadn't been there, or a disaster if the SEALs had been slaughtered, or if a helicopter had been damaged (as several aircraft were when Jimmy Carter tried to rescue the hostages from Iran). 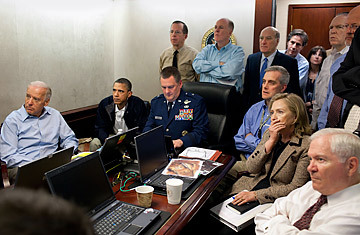 In at least nine National Security Council meetings, Obama insisted on reviewing every crucial detail of the operation. He made sure, after a decade of witless Islam-related goofs by U.S. leaders, that bin Laden's body would be handled and consigned to the lower depths in a way that would not offend Muslims; that in the early hours, at least, there wouldn't be gory photos or films or any evidence of barbaric gloating; that the operation would be surgical and stealthy enough that bin Laden's document hoard would be preserved and dispositive DNA evidence would be gathered. These are the sort of nuances  a word his predecessor mocked  that have marked many of Obama's foreign policy decisions, made in a deliberative style that his critics, and even some supporters, have seen as evidence of dithering or indecision. George W. Bush certainly deserves some of the credit for this raid. It would not have been possible without his decision to amp up human-intelligence assets and special-operations forces after decades of neglect. But you have to wonder whether Bush would have had the patience or subtlety to conduct this operation with the same thoroughness Obama did. Bush certainly lacked the strategic focus to understand that the war against al-Qaeda had to be primarily a slow-moving special-forces affair; he was diverted into bold gestures, like the disastrous war in Iraq. He never studied the intelligence rigorously enough; he bought the sources that backed his predispositions. He understood too late the style and substance of Islam, how words like crusade resonated through the region. His was a bumper-sticker foreign policy. His speeches were full of God and Freedom and Evildoers. His troops rushed into Baghdad in three weeks, and he celebrated their victory with another bumper sticker: MISSION ACCOMPLISHED. He was able to use these simplicities to win re-election in 2004, although he lost a lot of lives unnecessarily and damaged America's esteem in the eyes of the world. See stunning aerial photos of the Sept. 11 destruction. Watch TIME's video "Anatomy of a Raid."